Many of my clients will ask me, “How do I safely keep track of all my passwords”? 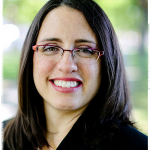 Keeping track of passwords while keeping them safe and secure in a cyber criminal world adds to the organizing dilemma. Here’s a quick primer on Password Management. It only scratches the surface but it will get you started on the right foot. Choose – Electronic or Paper? You can record all your usernames and passwords either electronically or via paper. Both have their pros and cons concerning portability (can you access your passwords on the road or do you have to be sitting in your office? ), compatibility (what computer platform do you use and can you access it via your mobile? ), and of course security (can this easily be stolen, hacked, or destroyed?) You’ll have to do some homework, and you can start by looking at some of the options below to help you make your own decision. These password managers come in the form of software you can download to your computer or a USB drive or in the form of cloud software. Many offer password generators, auto form filling options, and one-click login. Of course, the key feature that appeals to everyone is that you only have one username and password to remember which allow you access to all your other usernames and passwords. Whether you decide to save your passwords on your home computer, a USB drive or online, make sure to back-up your lists and store that back-up in a different location (preferably a safety deposit box). These password managers are easy to store on a desk or shelf, to carry in a bag during travel, and to organize in whatever format feels comfortable to you. Of course, if you lose it or it gets stolen, you’ve lost and compromised all your passwords. That is a major consideration to keep in mind. If you decide to go with paper management, you may want to think twice about taking your passwords outside the house, unless necessary. Like the advice above, make sure to make a back-up copy of your notebook and store it in a secure location. After you choose a password manager, take the time to finally strengthen and change your passwords. More than likely you’ve been falling into the practice of using the same password for multiple accounts or you’ve been using the same password for years on the same site. If you need help creating a new strong password, all of the electronic password managers mentioned offer strong password generators. For those using a paper manager, you can generate a secure password on Cloudwards or test to make sure your current passwords are strong enough. This site gives you on screen ability to generate a password and determine length, use of symbols, and whether you want upper or lower case etc. and it’s free! 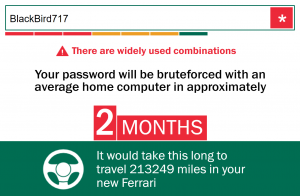 Think your password is secure enough? 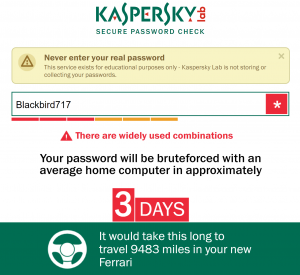 Visit Kaspersky or HowSecureIsMyPassword to see how long it would take someone to hack your password. It might leave you speechless. 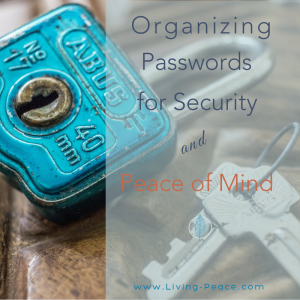 Since password security has become even more important in today’s world, let’s give ourselves the gift of a little peace of mind! Griffith, Eric. 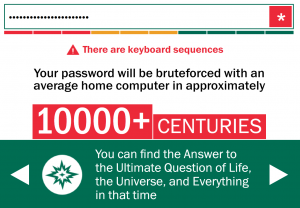 Password Protection: How to Create Strong Passwords. PCMag, November 29, 2011. Microsoft. Create Strong Passwords. and The Importance of Using Strong Passwords. Mills, Elinor. Facing the Pain of Passwords. CNET, July 15, 2008. *Article, references and links updated. Original article published 9/24/15.